Where Can I Buy Unroasted Green Coffee Beans? 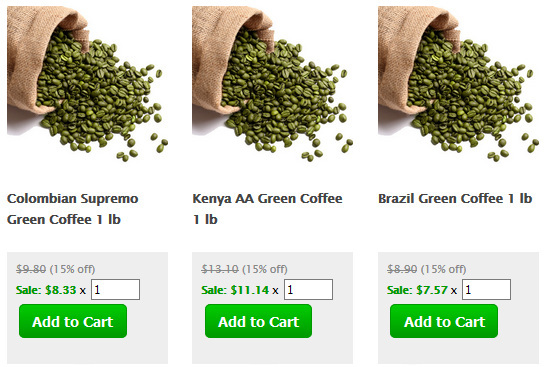 Where you buy green coffee beans from will depend on your purchase volumes. Green coffee is sold in container quantities (45,000 lbs) via exporters in the origin country, typically to brokers and green coffee importers in the receiving country (United States and Canada). They’re then sold by the bag (132-lbs) to coffee roasters, which may re-sell them in smaller quantities, such as 20-lb or 50-lb bags. Each step along the way adds additional costs because of processing and labor, resulting in gradually increasing prices as the quantities get smaller. Each step also adds time, which is not coffees friend. Green unroasted coffee beans are found in the coffee cherry (the fruit) of the coffee tree. Typically found 2 beans per cherry, there’s also a more rare single bean per cherry which is identified as a “peaberry” bean – these are larger than regular beans and more difficult to roast, but are often seen as a higher grade. Green coffee beans are unroasted (raw) coffee beans that have been processed and dried and are ready for roasting. Though they are called green coffee beans at this stage, they are typically more of a bluish-green color. The processing of the coffee beans may be either wet processing (washed coffee), dry processing (unwashed, or natural coffee), pulped natural processing, or semi-washed processing. The processing method affects the flavor development of the bean once harvested, but the end result is the same – the coffee is dried and graded (sorted), then bagged and sold. After the coffee is processed and dried it needs to be properly stored to prevent the growth of mould and mildew. Under proper conditions, they will last for years in storage but roasted coffees are always better as close to the processing date as possible. Storage can either be in the originating country, or at broker facilities, or at the actual roasting facilities, or at the home of home roasters. Green unroasted coffee has a long shelf life – 6 to 12 months – over which time it gradually loses some flavor. For home use, you’ll want to balance buying in large enough volume to get some discounts, but generally not keep more than 6 months of inventory on hand. It doesn’t need to be stored in valve-sealed bags as there is no off-gassing going on, but it should be stored away from heat, moisture and sunlight. Farmers and cooperatives will sometimes store green coffees if they expect an upward swing in coffee prices later in the year, and can afford to sit on inventory. The growing season is typically year-round in coffee producing countries, with the harvesting season lasting about 3 months. Other times green coffee is stored for extended periods of time are when coffees are “aged”, which allows the coffee bean to change in flavor over the course of months or years to create something truly unique. This additional storage and labor involved in rotating the beans adds some cost to the coffees. This process isn’t foolproof however, and there’s always a risk that the coffee spoils or turns out worse than it originally was, and is worthless. Kenyan green coffees are some of the most highly sought after beans on the market – very flavorful and consistently highly rated in reviews and cuppings. Ethiopia has perhaps the longest history of coffee growing and exporting green coffees of anywhere in the world – it is supposedly where coffee originates from. The high altitude means that Ethiopian green coffee beans grow slowly and develop full, robust flavors. Known for complex flavors that work well in a medium and dark roast, Sumatran green coffee beans are a versatile option for both amateur and professional roasters. High production levels and efficient harvesting and processing methods of Colombian green coffees means that this mild flavored coffee acts as a great base in many blends. Similar to the Colombian coffees, Brazilian green coffees are mellow-flavored and make a great base for blends – keeping costs low while allowing the primary beans to shine through. In recent years many specialty coffee lovers have begun purchase green beans so they can roast their coffee at home. Home roasting allows you to enjoy the best truly freshly roasted coffee and thus appreciate the best flavors and aromas the particular premium coffees have to offer. Gourmet green coffee beans are available from most coffee-growing countries, and with the rise in popularity of home roasting in recent years the availability of green beans will surely increase as well. While the best prices are reserved for wholesale buyers buying in bulk quantities (often containers of 40,000 lbs), there are companies that are willing to part with some of their own inventory in smaller quantities. Organic and Fair Trade green coffee beans are also available for purchase, as are decaffeinated green beans. While organic certification is more of a “feel good” label once the coffee has been roasted (the roast process destroys all chemicals/fertilizers), the actual green coffees do technically benefit from the different treatment. There are a number of Fair Trade and Organic certifications on the market. Some of the more popular are Fairtrade International (FLO, or “Fairtrade Labelling Organizations International”), Fairtrade Canada. “Free Trade” is not a coffee certification, though sometimes people ask for this in confusion. The coffee market prices green coffee beans by 60 kg (132-lb) bags, which is the norm throughout most of the world. Some countries that were colonized by the Spanish use a 70 kg (154-lb) bag while still others do 50 kg (110-lbs), however these prices are still derived from the per-lb price on the market. Wholesalers maintain relationships with farmers and growing co-ops and deal with the import directly into a country in container-load quantities and then re-sell bulk green coffee beans in smaller quantities to roasters and distributors. All great coffees first start out as unroasted green coffees – the importance of starting with the best quality bean grown at high altitudes with good rich soil can’t be understated. From there, it’s time to roast, grind and brew. For step-by-step instructions on how to make some fabulous espresso drinks see Espresso Drink Recipes, Pulling A Perfect Espresso Shot, and How to make a Latte. To read about premium coffee flavor profiles see Gourmet Coffees. For definitions of coffee terminology see the Espresso Coffee Guide’s Coffee Terms.